COOL: Non-Alcoholic Beer | Everything is cool. Booze and me go WAY back, we do. I’ve got some ace drunken stories and at least two hospitalizations under my belt. So how did I come to this?! Well, this idiot girlfriend of mine who in fact edits this blog, bought a SIX-pack of BECKS Blue by mistake over the weekend and had the cheek to leave it in my fridge in disgust. Come the beginning of the week, I was dealing with that Monday Morning Booze Itch. 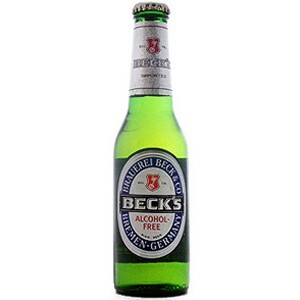 I opened the fridge to find a manky old spring onion, coffee granules all over the place and the portentous BECKS Blue. Now hear me: I’m gonna keep boozing real booze. So much in fact that I’ll probably end up pickling myself. BUT we’re all tryin’ to cut down right? And there’s an occasional place for non-alcoholic beer, like there’s a place for semi-skimmed milk, low-fat Philly and light mayo. Don’t diss it before you try it, yeah?